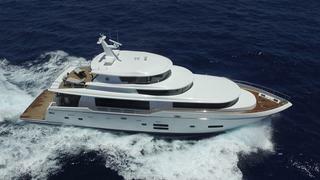 A brand-new Johnson 93 motor yacht has been listed for sale by Jeff Stanley at Gilman Yachts. Built on spec in GRP by Taiwanese yard Johnson Yachts to a design by Dixon Yacht Design with delivery in 2016, she recently arrived in Fort Lauderdale, Florida where she now awaits her first owner. A relaxing interior décor with light anigre wood panelling and flooring in ash laminate accommodates eight guests in four cabins consisting of a main deck master suite, a full beam VIP suite aft, a convertible double to port and a starboard twin, all with entertainment centres, LCD television screens and en suite bathroom facilities. In addition, there are quarters for three crew. Being neaarly full beam, the main saloon is exceptionally spacious with an L-shaped white settee and coffee table to port and a full bar to starboard. Opposite the settee is an entertainment centre including a 50 inch LCD television screen on a rise and fall mechanism while further forward is the dining area with a table seating eight guests and storage cabinets for tableware. Up on the flybridge, al fresco enjoyment is guaranteed, with two helm seats, a bar, fridge, ice maker, stainless steel barbecue grill and ample seating, all shaded by a custom GRP hard top. Aft on the sundeck area of this yacht for sale are loungers and sun pads. Twin 1,900hp Caterpillar diesel engines give her a cruising speed of 21 knots. On display at the Fort Lauderdale Boat Show, the new Johnson 93 is asking $4,750,000 with US duty paid.